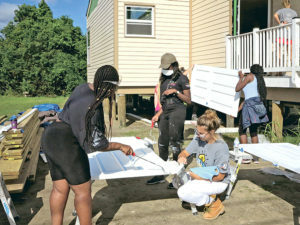 Since 2010, an annual group of British Ursuline students has made the long trek to New Orleans help rebuild houses sponsored by the local Ursuline Sisters through their partnership with the St. Bernard Project (now called SBP). Founded in 2006 to help residents uprooted by Hurricane Katrina return to their homes, SBP is now active in six states and has brought home more than 1,500 families impacted by natural disasters, including the 2011 tornado in Joplin, Missouri. “Once we build a house, it’s more than just putting a roof over someone’s head. We come as compassionate people. We come to serve. We come to give them encouragement,” said Ursuline Sister Regina Marie Fronmuller, the New Orleans-based woman religious who spearheaded the Ursuline-SBP partnership in 2008. With elbow grease and donations from Ursulines’ global network of alumnae and friends, the Ursuline Sisters have sponsored five SBP houses to date in the Upper 9th Ward, Lower 9th Ward and New Orleans East. 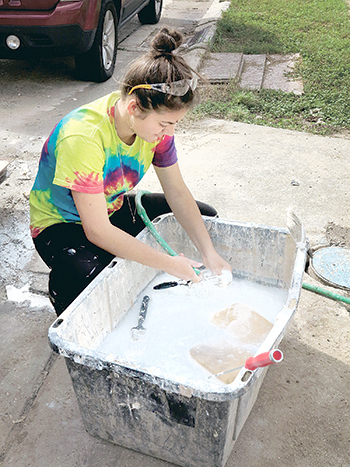 Last month’s teenage crew from London arrived to a nearly completed house, taking on finishing touches such as exterior painting, caulking and the installation of molding, doors and flooring. Incredibly, more than 13 years after Katrina, some parts of the Lower 9th Ward are still “jack-o’lanterned” – a random patchwork of new builds, dilapidated houses and prairie-like spaces exploding with goldenrod and debris. 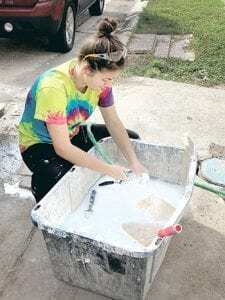 Ruby June Powell, a student at Ursuline High School in tennis-famous Wimbledon, said her New Orleans-forged skills include getting over her fear of climbing ladders and learning how to install baseboards. Powell said she was bowled over by the friendliness of strangers on her first big trip across the pond. The Anglo-American collaboration took off in 2010, when Sister Regina Marie reached out to Sister Kathleen Colmer, the provincial of the London-area Ursulines, to propose an annual “service exchange” in which British Ursuline students in the sixth form (the British equivalent of American high school seniors) would come to New Orleans to work on houses, and groups of American Ursuline alumnae would volunteer at soup kitchens and homeless shelters in the U.K.
“We are united through our motto of Serviam – ‘I will serve,’” Sister Regina Marie said. “We Ursulines are global. We are one. We arrived (in New Orleans) in 1727, and there’s still that friendliness, that following in the steps of St. Angela, that stronger need to serve than to be served,” she said. Story and photos courtesy of the Clarion Herald, the official newspaper of the Archdiocese of New Orleans. As summer began, most students were looking forward to a break from classes and the daily grind. 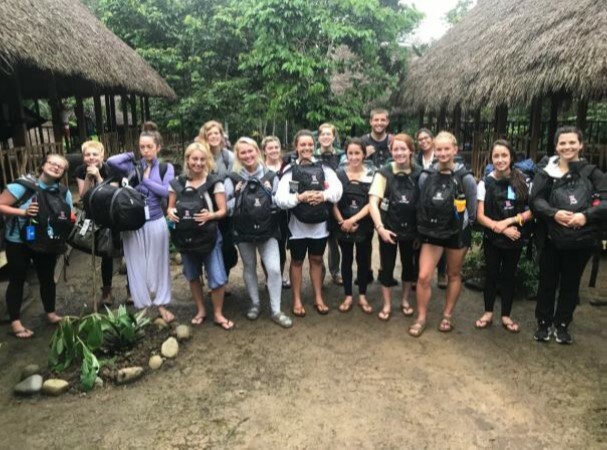 For educator Amanda Neill and her 13 sophomores and juniors from Ursuline Academy in Wilmington, Delaware, they were actively embracing a different kind of daily grind – a full week of globally-minded, leadership-based service in Ecuador with WorldStrides Camps International. This rustic program wasn’t like any school trip Ursuline’s students have ever experienced. As a seasoned-traveled school, they have traversed the globe. But on a WorldStrides Camps International program, students are taken to locales that are facing significant obstacles, as well as opportunities. They live among locals and steep themselves in service experiences. Ursuline students got off the plane in Quito and six hours later, through the Andes, into the Cloud Forest, and through the rainforest, they had made it to their destination — Camp Ecuador. Their goals for the week were significant: help build a water collection tank and a septic system, teach English classes and help refurbish furniture for the village’s school. Each student would take turns in a leadership role to complete each day’s tasks. They knew that each task would help support the community. 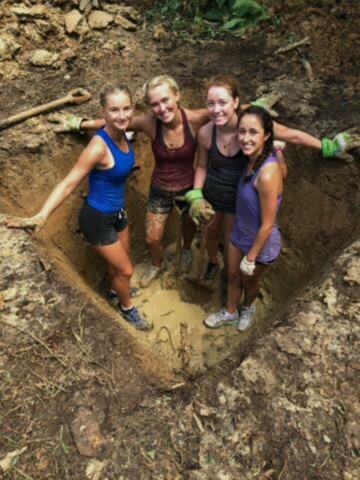 “Each time we completed a task, whether it was building a shelf or a septic system, we felt more capable,” said Jane Lyons. As they were leaving and saying goodbye, the students left their luggage filled with clothes and shoes for the villagers. “It was our way to say thank you and to give them something they would need. We practically left with the shirts on our backs,” said Shearer. Both Lyons and Shearer agree, “This trip changed our lives”.